The sleeping pods make for an unusual discovery in the forest (photo: Natalie Mendham). 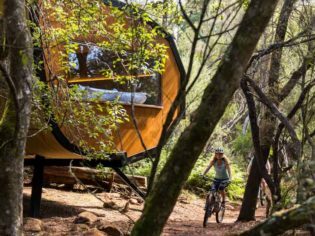 A challenge for the body and a balm for the mind, the Blue Derby Mountain Bike Trails, in the hills of Tassie’s north-east, are fast becoming a mountain biking mecca for the adventurous. There’s a sweet spot in any sport – a time when everything comes together. For a brief moment you experience nirvana; it could be a perfect stroke in a tennis match when ball, racket and body become a single entity for a blissful fraction of a second to set up a sublime shot. 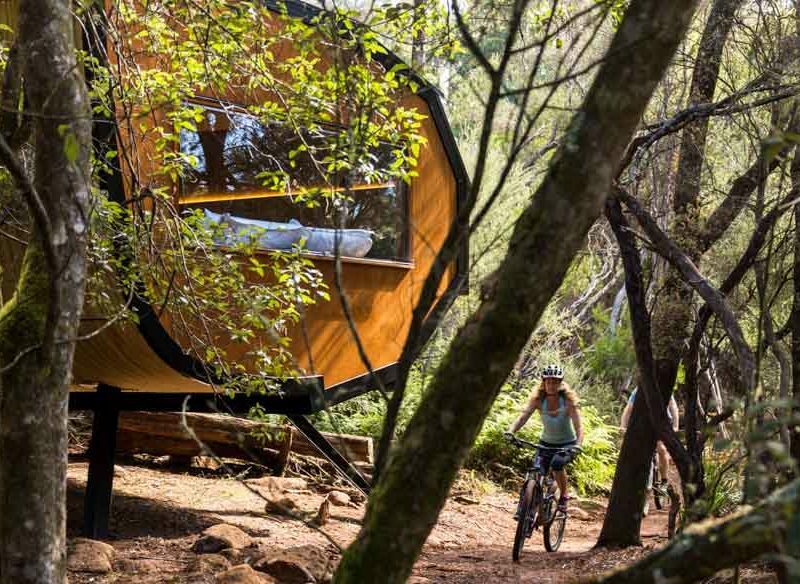 Up in the hills around Tasmania’s quaint town of Derby, 100 kilometres north-east of Launceston, there’s a way you can achieve this feeling for a protracted period, grinning from ear to ear as you hurtle through ancient forest. It’s called ‘flow’, mountain biking’s holy grail – a meditative state that will take you beyond anything any yoga retreat can claim to offer. I’m not an experienced mountain biker, but with just three days in the saddle with Blue Derby Pods Ride I was up to a level where I was able to taste this delicious state of being. The sun sets through the trees behind one of Blue Derby Pods Ride’s intriguing abodes (photo: Natalie Mendham). The Blue Derby Mountain Bike Trails opened in 2015, weaving paths throughout the Derby region. And such is the quality of the terrain, its perfect mud and the beauty of the forests, that it’s started attracting the best in the world; last April, Derby hosted the Enduro World Series – the Formula One of mountain biking. My first day is about getting used to handling the new full-carbon-fibre frame bike with a complex set of suspension rigs I’ve been handed. It skips over everything the trail throws at me – errant boulders and tricky ‘rock gardens’ are absorbed with ease by this gorgeous machine. Blue Derby Pods Ride has a deal with a local bike shop to always have the latest equipment and guests can purchase their steed – at $5000, I decide to leave it in Tasmania. We stop to admire a view out across the hills and forests ahead. In parts, old forest appears to adjoin areas that are in the process of being, or have recently been, logged. A state government attempt to make 356,000 hectares of forest available for logging, including some of the coupes around the Derby mountain biking trails, was recently defeated in the Tasmanian upper house. You cycle under a huge arch to enter the accommodation (photo: Natalie Mendham). With visitor numbers to the region up 250 per cent, helped largely by the influx of mountain bikers, not to mention the global recognition achieved by hosting something like the Enduro World Series, the sport has helped the local economy monetise these trees in a way that doesn’t mean they have to be destroyed. It’s as if the trails are a network of life-giving arteries and makes this whole experience feel entirely virtuous; tourist dollars are essentially protecting the gullies of tree ferns, 700-year-old towering myrtles and the wildlife they harbour, which flash by on our way down to our home in the woods for the next two nights. The pods are pared-back, simple spaces (photo: Natalie Mendham). Tara and her husband Steve could have gone down the traditional route when planning their guest accommodation for Blue Derby Pods Ride – miner’s cottages, say, would have been entirely fitting with Derby’s history as a tin mining town. But having secured the rare opportunity of a long-term lease on a plot within the Derby Regional Reserve, the couple built a contemporary masterpiece. It makes for a dramatic entrance as you round a bend and ride under the arch hanging off the impressive structure. Nestled among a copse of blackwoods, private sleeping pods sit away from a central hub. They’re minimalist to the extreme with curved walls wrapping up over a big bed, LED strip lighting recessed into exposed plywood giving it a pared-back Scandi feel. A large window frames the forest; John says he’s spotted sugar gliders here and it’s wonderful to lie propped up on some pillows looking for life among the moonlit trees. The hub is all clean lines of plywood, a big wood burner dominating a lounge and a communal dining table; the furniture is solid and finely crafted by Tara’s brother, Marcel, a renowned carpenter. Big sliding glass walls open up onto a deck with views down to the Cascade River Valley. The pods are cosy and comfy nooks (photo: Natalie Mendham). Tara and John offer a selection of cheeses from Coal River Farm down south, local wines and beers as we sit on bean bags around the fire. Dinner is Scottsdale pork and potatoes from nearby Cuckoo Valley, with a Parmesan and rocket salad – the leaves from York Town Organics on Tassie’s north coast. We finish with lemon tarts from Launceston’s Manubread bakery and coffee from Provenance Coffee Co. run by Launceston resident Jesse, who heads out to farms in Colombia to personally source his produce. Staying in this part of Tasmania, you get the sense that Australia’s brightest young minds have set up shop here; from the local produce to the solid dining table it’s served on, and the showpiece of contemporary design that surrounds it all, it fills you with inspiration. Legs burning and my heart threatening to explode, I’m not feeling inspired at 8am the following morning. It’s a testing hill climb to start the day, with John and Tara offering encouragement – I feel the calories evaporating; you’ll eat well and get fit over just a couple of days of exerting yourself up here. We’re soon on a flat, and rusted wrought iron pipes follow the trail, barely visible snaking along beside us as the moss and lichen subsume them. The pipes once carried water from the Cascade Dam upriver to scour the landscape, blasting away earth to excavate tin. Parts of the trail we’re on now would have been unrecognisable. Guests commune, eat and drink at the main hub (photo: Natalie Mendham). “There was nothing here in 1920,” says John. “But since the mine closed in 1946, the forest has completely regenerated.” He tells us of a disaster that struck in 1929: following a record rainfall the dam burst and obliterated the town, killing 14 people. “One house was lifted up, floated off and resettled elsewhere,” he says. “Apparently the tea service was still laid up on the dining room table.” As if to illustrate what a dramatic change the town has been through over the last century, some of the steep, banked bends (called berms) on the trails are shored up by boulders left over from mining. Our route takes us to the reservoir of the dam, through temperate rainforest, on winding trails down to Derby. It’s delirious fun; with either Tara or John riding up front and shouting instructions I can confidently hit the track at speed. “Lean back, lean back,” shouts John as I nearly jump down a steep, rocky descent. The trails were built by renowned track designer Glen Jacobs of World Trail, and they preserve your momentum like you’re on a roller-coaster, dipping and rising before plummeting again. I start to master the ridiculously light bike and copy Tara in doing little bunny hops over lumps and into corners. At some point I realise that I’ve forgotten about everything other than the trail coming at me relentlessly, my body and brain forced to simply react – I feel this thing they call flow. You’ll have the attention of two guides on your tour (photo: Natalie Mendham). The descent starts in the alpine tundra of the plateau and the air up here is so pure that it’s a haven for various species of pale lichen that gracefully drape the scrub with their delicate structures as if placed by some hipster florist. From the tundra, we hit cloud forest; it’s such a sudden transition and the change in light so dramatic that I slam on the brakes to take it in. It feels like we’ve crossed into another world; gone is the opaque white of the tundra and an all-consuming deep green pervades. We’re in the Goblin Forest: a dense network of ferns and moss-covered eucalypts, an attractive creek running through it all. John pulls up beside me and smiles; they kept quiet about this so as not to ruin the surprise. Th pods are hidden away under an elevated walkway through the forest (photo: Daniel Down). What our group now describes as ‘long sections of flow’ mean that we make quick work of winding our way through the Blue Tier Reserve, its towering myrtles and groves of colossal tree ferns. We come to a stop at the attractive Weldborough Hotel and there’s time to reflect on the journey; it’s one in which you can settle your mind and be good to your body too, be inspired by the people, and in doing so help make this sleepy Tasmanian town’s newly discovered paradigm a shining example of what can be achieved in the rest of the state, the country, the world. Grab a coffee at this cafe on Derby’s quaint high street (photo: Daniel Down). A three-day guided tour of the Blue Derby Mountain Bike Trails with Blue Derby Pods Ride starts from $1750. This includes all meals and beverages, return transfers to Launceston, private accommodation for two nights in one of the pods, full equipment hire, guides and shuttles to various parts of the region.